Fortis Organ Retrieval and Transplant organized India’s first International Summit on Organ Donation after Circulatory Death at Fortis Memorial Research Institute (FMRI), Gurgaon. The Summit is spearheaded by Dr. Avnish Seth, Director FORT – Fortis Organ Retrieval and Transplant. The event was graced by Chief Guest Dr. (Prof) Jagdish Prasad, DG, DGHS, Ministry of Health & Family Welfare. A beating heart is central to the concept of organ donation following brain death (BD). In BD, injury occurs to the brain so that the brain dies but the heart continues to beat for a few hours or days, thus maintaining vital blood supply to the organs. What if we take organs for transplanting after death, once the heart has stopped? How much time do we have? Do such organs work? What are the legal and ethical issues? Organ donation after circulatory death (DCD) has been tried in several countries since 1995. It is widely accepted that once the heart has stopped for a period of 2 to 5 minutes, there is no possibility of a person coming back to life and organs like kidneys, liver, pancreas and lungs and even heart can be retrieved and transplanted. Once the heart stops, the attending physician declares death and after a mandatory stand-off period of five minutes, the transplant surgeons begin the surgical recovery of the organs ( with the permission of the family). However, in India there is no clear law on end of life care, withdrawal of life support and passive euthanasia. However, it is estimated that last year the process of organ retrieval could not be completed at least 50 patients with BD even when the families consented to organ donation as the heart stopped before the process of organ retrieval could be completed. This is the scenario for DCD that needs to be considered in India till there is more clarity on laws related to end of life care. The speakers at the event will be stalwarts Dr. Marti Manyalich, President, TPM – DTI Foundation, Spain, Chief of organ donation program at Spain having the highest organ donation rate in the world. Dr Marti is also the President Elect of International Society for Organ Donation and Procurement. Mr. Darius Mirza, Professor of Hepatobiliary & Transplant Surgery, QE Hospital & Birmingham Children’s Hospital, UK. He comes with an extensive experience with over 250 DCD liver transplants. Dr. Kumud Dhital is a Cardiothoracic & Transplant Surgeon, St. Vincent’s Hospital, Australia credited with the first successful heart transplant from non-heart beating donor in Sydney, 2014. The Summit was also be attended by luminaries from the healthcare industry such as Dr N S Dharmshaktu Additional DG, DGHS, Ministry of H & FW, Dr. Sunil Shroff, Managing Trustee Mohan Foundation and Dr. Saudan Singh, Director of National Organ & Tissue Transplant Organization (NOTTO). 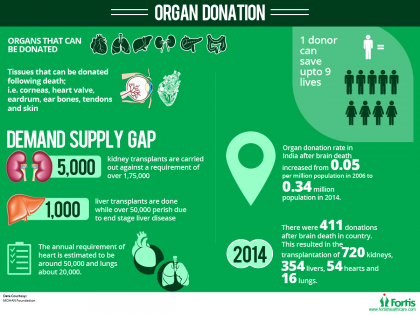 The demand for organ transplantation has rapidly increased all over the world during the past decade due to the increased incidence of vital organ failure, the rising success and greater improvement in post-transplant outcome. However, the unavailability of adequate organs for transplantation to meet the existing demand has resulted in major organ shortage crises. As a result there has been a major increase in the number of patients on transplant waiting lists as well as in the number of patients dying while on the waiting list. In India, less than 5000 kidney transplants are carried out annually against an estimated requirement of over 175,000. Similarly, only 1000 liver transplants are performed every year in a country where over 50,000 perish due to end stage liver disease, mostly related to preventable causes like hepatitis B and hepatitis C. The annual requirement of hearts is estimated to be around 50,000 and lungs about 20,000. Established in 2012,Fortis Organ Retrieval and Transplant (FORT) provides a registry to pledge ones organs during life and 24-hour referral service for assistance with documentation and procedures related to the process of organ donation.